Hundreds gathered for the 2016 Independence Day Winona Lake, Ind., Festival of Music concert. 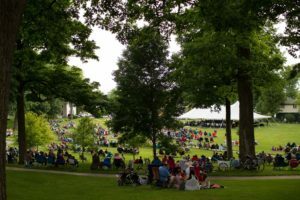 The Symphony of the Lakes will perform the third summertime concert of the Grace College and Village at Winona Lake, Ind., Festival of Music. “Summer Surprises with the Symphony” will take place on Saturday, July 1, at 8 p.m. in the park at Winona Lake below the outdoor amphitheater. The free outdoor pops concert will feature favorites from stage, film and patriotic standards. This special event will be followed by the annual Independence Day fireworks. From symphonic classics to brand-new compositions, the Symphony of the Lakes brings music-lovers of all types together through its wide variety of programming and talented musicians. On July 1, the 60-piece professional orchestra will perform pieces from the Broadway Stage and the Silver Screen, as well as patriotic pieces, to celebrate Independence Day. These will include a salute to those who currently serve and have served in all branches of the Armed Services. Special guest performers will feature Thomas Clay Hall, director of choirs at Warsaw Community High School, and a select high school vocal ensemble who will perform an Andrew Lloyd Webber piece and a melody from “Mamma Mia.” Also during the concert, The Wagon Wheel will announce exciting plans for the 2017-2018 Symphony season. Subscriptions will be available for purchase. In case of rain the concert will take place in the Winona Heritage Room. Audience members are encouraged to arrive well before the 8 p.m. start time to get a seat, and are asked to bring their own chairs or blankets. The second annual Festival of Music is sponsored by Grace College, Wagon Wheel Center for the Arts and The Village at Winona. “Summer Surprises with the Symphony” is underwritten by a grant from the Kosciusko County Community Foundation’s Kralis Community Funds and Mikesell Endowment Fund for MasterWorks. Support is also provided by Parkview Health, Pinnacle Advisory Partners, and Walmart. For more information on the Festival of Music, please visit grace.edu/musicfestival.